I haven’t exactly been prolific these days in adding new posts but I’m still hanging in there. Work, kids out of school…..I never run out of excuses! Autumn is approaching fast but its still end of summer for me. I wanted to share with you a fish salad I made while staying in Puglia earlier this year. The Italians call it crudo, which is chopped raw fish served ‘naked’ or sometimes in the ceviche style, marinated in citrus or vinegar. With the sea on their doorstep, the galactic array of fish is pretty mind-blowing. As you can see in the photo below, a visit to the pescheria is no ordinary experience. 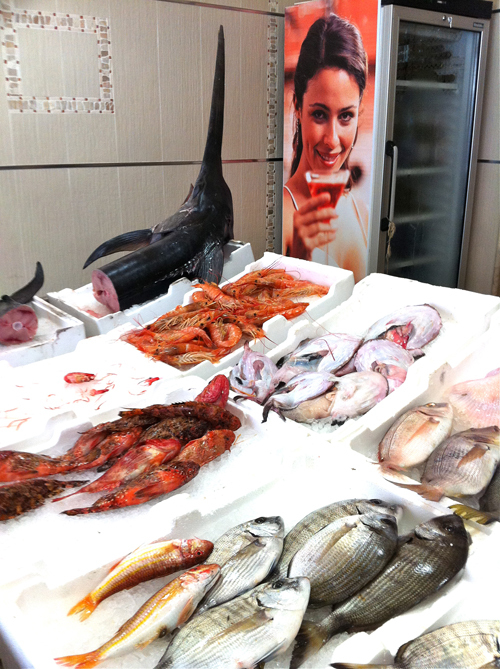 Swordfish, tuna, and monster sized prawns are all prominently displayed. One of their specialties is ‘purple prawns’ which are small pink/purple shrimps they proudly serve with just a drizzle of olive oil. Eating a raw prawn isn’t for the faint-hearted, and although they were delicious, I personally like my crudo ‘cooked’ in a bit of citrus. My family and I bagged up some fish and came up with this delicious salad. Although you can whip this up anytime of the year, it’s particularly refreshing in hot weather. Ceviche, carpaccio or sashimi sound intimidating, but are actually very straightforward. Getting spanking fresh fish is obviously first and foremost. Buy it on the day and get your fishmonger to remove all skin and bones. 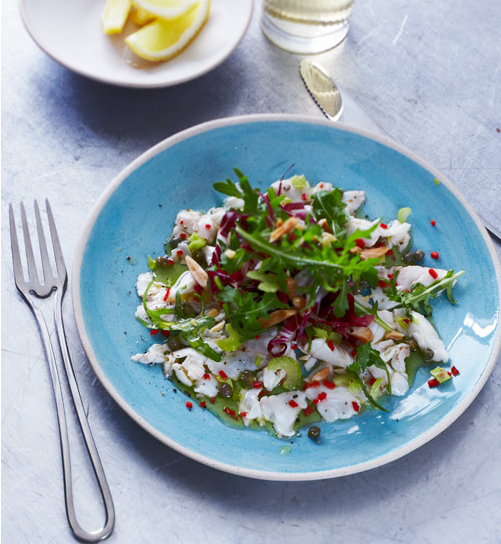 Scallops, prawns, sea bass, tuna or any non-oily fish can be used. Find the sharpest knife in your kitchen and thinly slice or dice it, depending on your level of skill. Marinate it in citrus like lemon or lime with a touch of white wine vinegar. A good amount of salt is vital for the depth, but this will all be discarded after it ‘cooks’ in the liquid. Draining and redressing the flesh is what keeps it from tasting too fishy. Gently toss it with peppery extra virgin olive oil and few chopped chilis to finish it off. After that you can add whatever salad you like; rocket, radicchio or mesclun. I threw in some chopped toasted almonds, crispy celery and a few capers. The flesh is completely ‘cooked’ after marinating and takes on a silky texture. The nuts and celery add a crisp contrast and together its a stunning dish. Slice the fish into very small pieces and place in a small bowl. In another bowl, whisk together the shallot, vinegar, lemon juice and zest and a generous teaspoon of salt. Pour over the fish, mix, cover and refrigerate for 1 hour. Drain the mixture, season and toss with the capers, half the olive oil, chili and some seasoning. Spoon the fish on the plates. 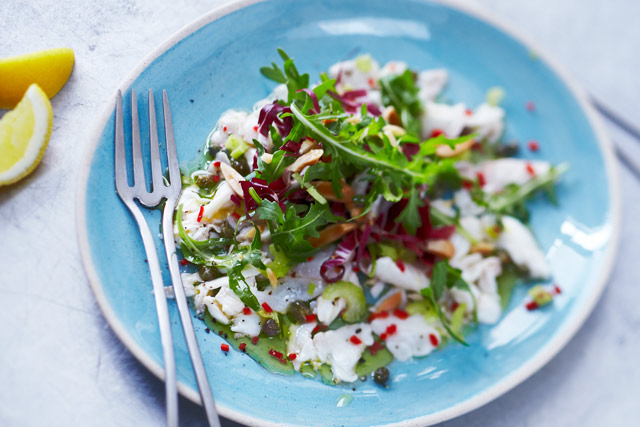 Place a bunch of rocket over the fish and sprinkle the celery and almonds over. Drizzle with the remaining olive oil. Olive magazine-I’m very excited to be included in the ‘Lessons I’ve learned’ feature about people who have changed their careers to cook and includes a full page photo…wha-hey! Oooh I love the colours in this dish. Such a summery dish, it makes me long for warmer days. Wow, I wish it was still summer so I could make this – it sounds amazing.